We are going to have some fun today, the car club is having a costume drive. Before we leave, we are having a Halloween breakfast to set the right mood for the morning. 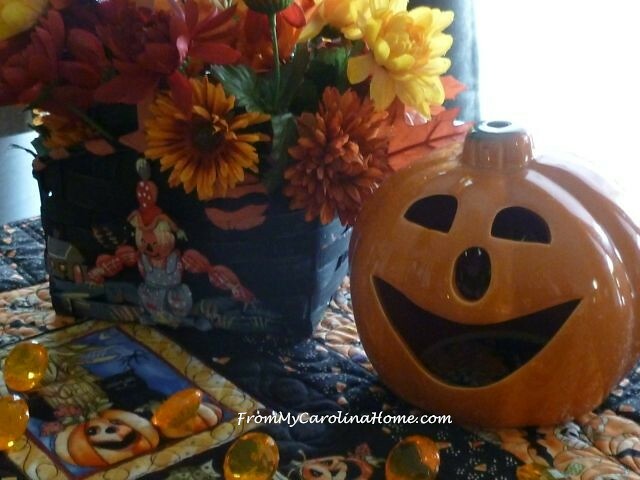 I set the table with some fun Halloween things, starting with a wall hanging that I am using as a table topper. It is a simple panel of Halloween fun to which I added borders, then quilted. The jack-o-lantern on the corner is a wool applique. I used the green placemats with black plates. DH likes cereal, so I topped off the setting with my pumpkin bowls. The table decorations include a cute Halloween basket with a scarecrow, filled with fall leaves and silk flowers in fall colors. A ceramic jack-o-lantern smiles at us on the right. There is a ceramic black cat with a jack-0-lantern on the left. I scattered a few of the large gold jewels around the table too. 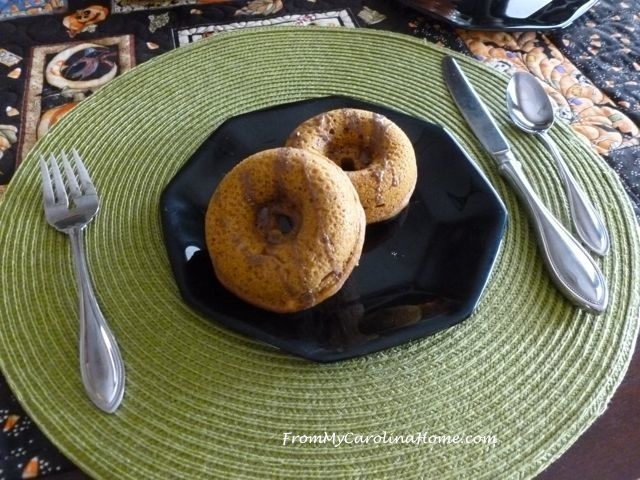 I made a new recipe, Spiced Pumpkin Cake Donuts just to serve this morning. 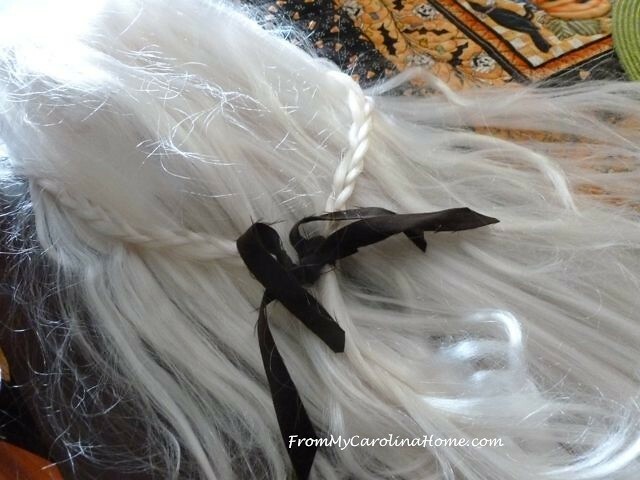 After breakfast, I am going to don my long blonde wig…. 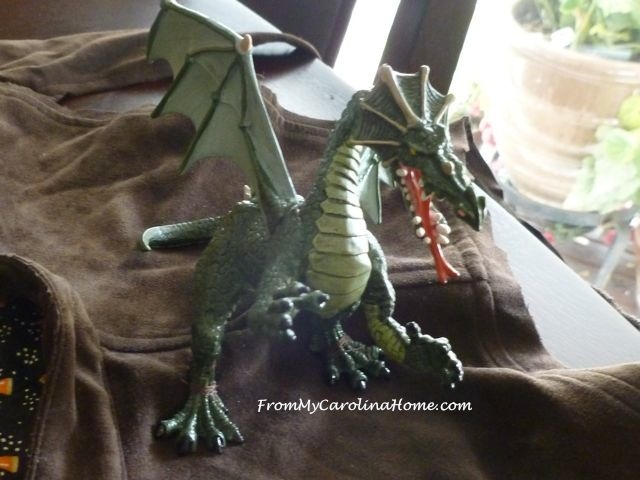 and secure my little dragon to my shoulder on a pad I made for him. I sewed his feet and tail down so I hope he will balance on my shoulder long enough to be effective as a prop. The pad has long tails to tie on the shoulder and arm, and secure across to the other side for stability. After Halloween, I’ll cut the threads and put him on my desk. Do you know who I going to pretend to be? Daenerys Targaryen from Game of Thrones, mother of Dragons and Queen of Meereen. I’ve read four of the seven novels so far, each one is almost 1000 pages! DH is going as Sherlock Holmes. Normally we do something as a couple, but not this year. We are driving up the Blue Ridge Parkway, so I hope to have some more autumn loveliness to post next week too. Happy Halloween! Are you planning any Halloween fun? Carole, I just so love seeing your table decorations for any holiday! Seeing your decorations and reading about them instantly brings a smile and such a good feeling! When my daughter was living at home, we always decorated for every holiday and then would go over and help my Mother decorate her house also. Now, the only holiday I decorate for is Christmas. Keep posting pictures and writing about your decorating, they are fun to read about and see. I do not know about either character you have mentioned, but I have a thing for dragons…so I hope to see you and your husbands costumes through photos. Have a wonderful time with your car club and Happy Halloween! As always, your table settings are always exceptional! Hubbs and I are going to visit the oldsters for a few hours as usual, then I will get prepared for the mass of kids. Love the Table Setting! Happy Halloween! Mother of Dragons! (for those that don’t know…from Game of Thrones). That wig looks exactly like my hair…even wore it like that yesterday. And, it IS real hair and naturally white. I answer those questions several times per week. Have a great time. Would love to see a pic of you in costume. 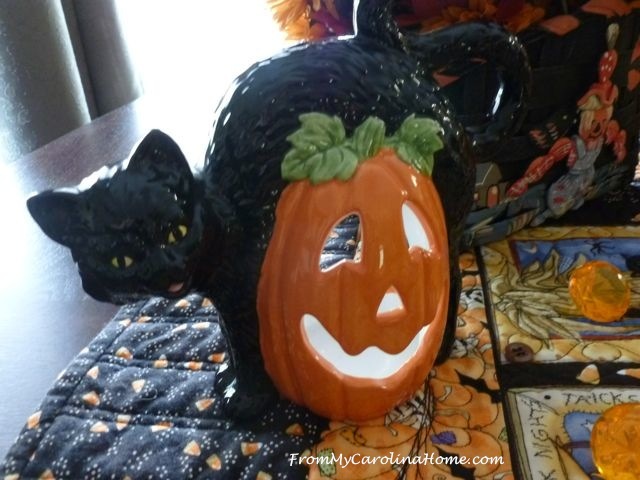 I love your halloween ceramic pieces-enjoy! I so enjoy, seeing your creative life. I love your Pinterest boards, but, in your blog I so enjoy your “process”. What an enchanting table to sit down to! Hubby & I dressed and attended a reading/performance of Edgar Allen Poe!! Carole-you are pure inspiration! Thank you for your blog! I hope you had a wonderful time with your car crew. As soon as I saw the wig I had an inkling of your costume plan! Fun!!! Oooh, can’t wait for the donut recipe! Your table looks so cute! And the ride sounds like a lot of fun! I loved your breakfast setting. John and I were traveling on Halloween, the first time we’ve totally ignored the day. I’ll consider reading your post as my celebration. Everything is beautiful on top of your gorgeous quilt! WOW! LOVE your table setting! Fabulous! Yum, those donuts look so good! Your tablescape is wonderfully festive! Your decorating is wonderful! 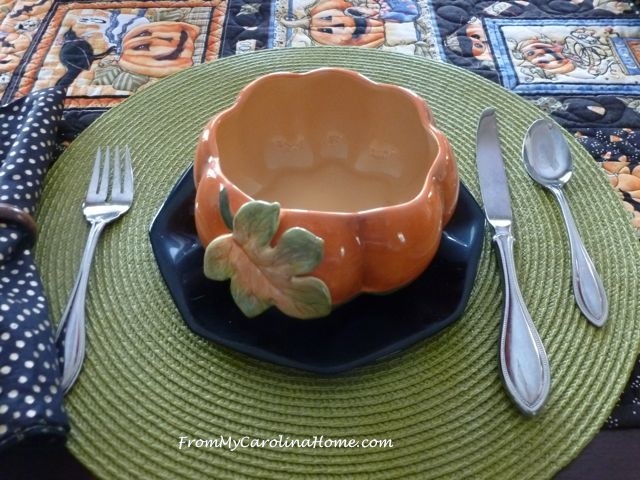 I love the pumpkin bowls and think I have to see if I can find something similar. I saved the donut recipe because I know that my family will LOVE them with cider at our next bon fire. Thanks! Cute Carole! I love your creepy wig, yikes! How fun and cute is your table? The wig is a great idea..ha ha. The pumpkin bowls are such a lovely addition. I shall be trying out the donut recipe. 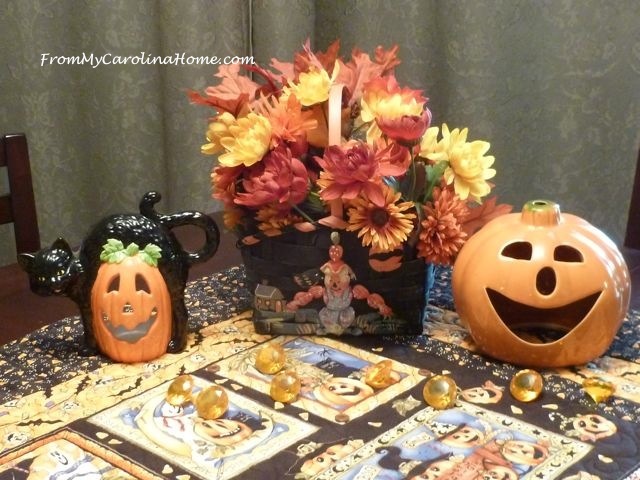 Thanks for sharing your fun table at our Halloween Tablescape Link Party. Your tablescape is so cute. I love the tablecloth. Did you make it? It’s darling. Have a wonderful day! It sounds like you are going to have a ball and I hope we get to see pictures. Using the wall hanging added lots of depth to the tablr and gave it a very cozy feeling. That was a cute table you set. I bet those pumpkin doughnuts were great! That quilt is so cute and made a great backdrop for your table. 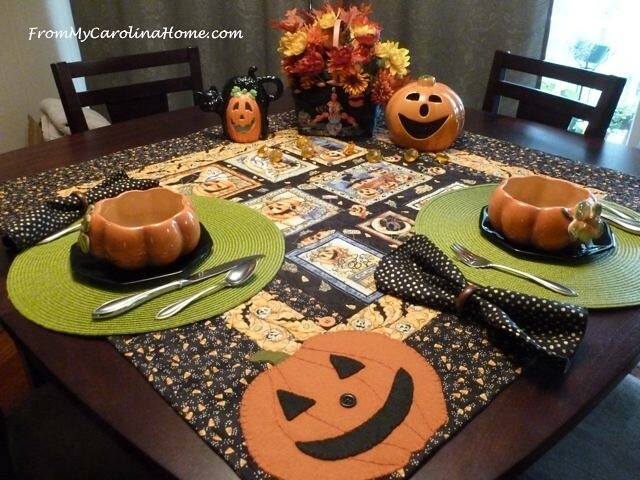 Such an adorable table, those pumpkin bowls are stealing the show!